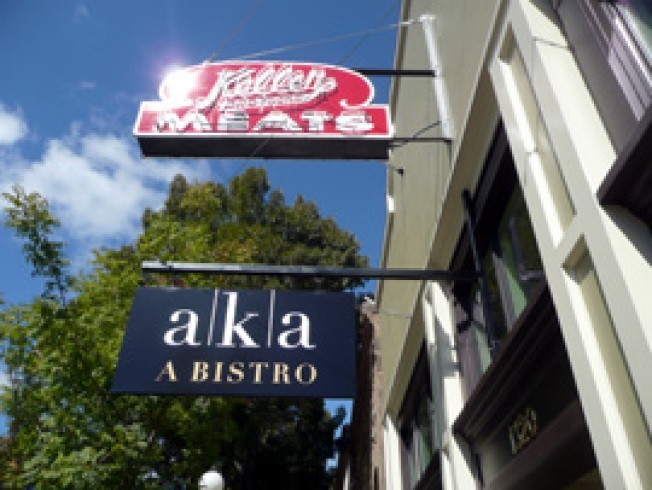 I stopped by the soft open at 'aka a bistro' in St Helena last night and their plan is to fully open for service this evening. The space is a bit different than I had expected with a very open floor plan and high ceilings. They've got something in the neighborhood of 70 to 80 seats with a space in the back that can be closed off for private groups and a little couch filled lounge area up front. The rear of the dining room has windows into both the kitchen and the reserve wine room. The bar seats around 12 and has a very prominent Vin Perdu wine dispensing system that will house their 20 wines by the glass. The wine list will have around 600 selections (if I recall correctly 100 of which will be under $60) and it was put together by the former GM at 25 degrees Brix ... The only food I got to taste was a sample of their reuben with homemade corned beef that was tasty although the richness of the one bite made me wonder if I could take down the whole sandwich. p.s.- Not to be pessimistic but... when I wanted to check out the menu I had a hard time getting the bartenders attention to ask for one despite there not being many people at the bar. I had to wonder if that might be a bad omen for the service training at the restaurant.